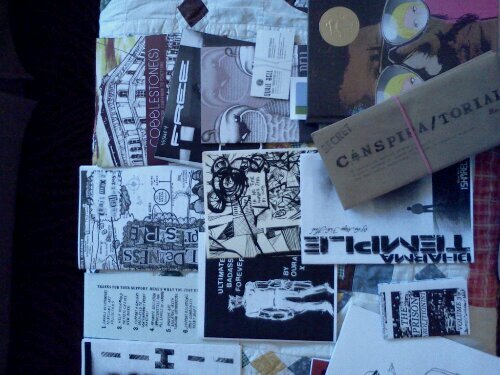 A Waterfall of Creativity | Robert Mitchell Jr.
Saturday I went to RVA Zinefest. 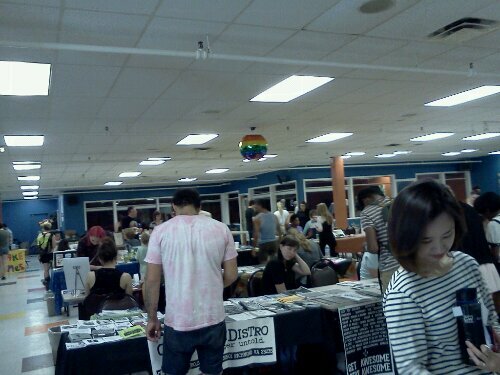 If you haven’t been to a zinefest before, let me tell you that it is like standing naked in a waterfall of creativity. Icy waves of unfiltered self expression wash over you, bracing you, exciting you, waking you up to new possibilities. It is the exact opposite of Hollywood polish, the antithesis of the focus-group powered ad pitch, the additive inverse of the end-cap, checkout-line-powered sales machine. Behind every table to you visit there is a person, an actual human being, who will talk to you and interact with you and have an actual conversation. You can stop and talk to Mo from the Wingnut, the hardest working human in the anarchy anti-business, or spend a few minutes with Oura whose art will blow your mind. Start a conversation with Aijung Kim and you not only will you have a better day than you expected, but you will see fifteen things on her table that you can’t leave without. Hang out at the Adhouse Books table and be smashed upside the head by some of the most beautiful productions you’ve ever seen. Over at Studio Two Three you can get zines that will show you how to silk screen and linocut and express yourself, and they’ll tell you about all of the amazing stuff they’re doing over at 1617 W. Main St.
Free stuff is everywhere — music cds, flyers, pamphlets, and yes, ‘zines. Some people are just trying to break even, others are trying to make a couple of bucks, and there are a few semi-pros running from one event to the next trying to pay the bills. On one end there is a guy named Yuri Realman (or is that an alias?) selling a fascinating project called Conspiratorial. On the other end of the hall you can meet Christine Stoddard from Quail Bell and buy something truly beautiful. There are workshops on everything from beekeeping to reproductive rights. 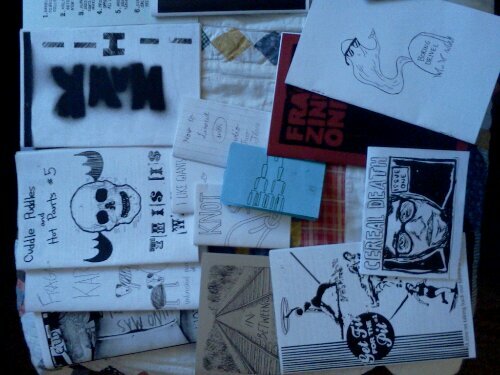 There’s an area with free materials where you can make your own ‘zine right there on the spot. You can ramble from pillar to post. You can drink great coffee and eat good food from Lamplighter. You can forget you even have a cell phone. Before I knew it it was time for my five o’clock “How to Tell a Story” workshop. It was the end of the day and everybody, including me, was fully exhausted. Attendance was low — only two people — but both of them tolerated my rambling without yawning too much. One of them was Megan who heads up Trail Mix (a cool person who puts out a very cool zine). See what a mean? 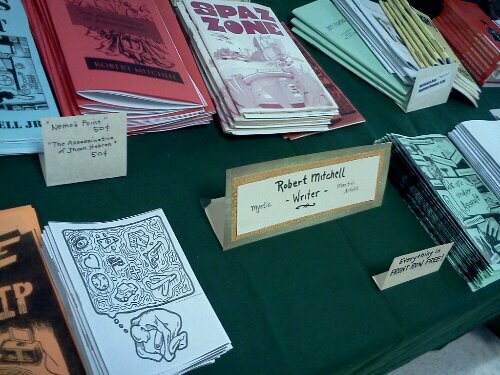 Everywhere you go at Zinefest there’s another person to meet, another smile to share, and another inspiration. This entry was posted in Writing and tagged zine, zinefest. Bookmark the permalink.